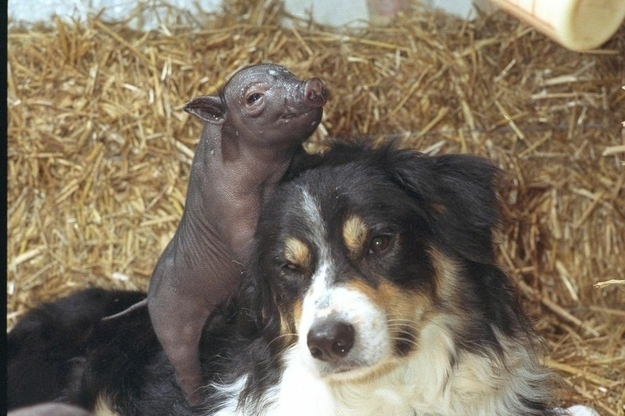 While we may think that farm animals prefer hanging out with their own kind, the truth is friendship comes in all shapes, sizes and species. Most farm animals don’t get the chance to pick and choose their friends, and many spend their entire lives locked in tiny cages barely able to move, isolated and alone. After arriving at the sanctuary, Lucera and Luna became instant besties. Always together, they spend their days grazing on the green grass, playing hide and seek, or snuggling down in a big bed of straw with Lucera resting her little head on Luna’s back. Both abandoned when they were just tiny babies, Ryan and Hemingway didn’t let hooves or wings get in the way of their friendship. Desperate for comfort and security, they helped each other heal and in turn formed an inseparable bond. Wherever Olga goes, Emma follows! Whether they’re snuggling up in one of the dog beds, or Emma’s chasing after Olga’s fluffy little tail, this super cute couple have become the best of friends. Separated after welfare officers seized animals who were forced to live in atrocious conditions, Mr. G and Jellybean were sent to different sanctuaries. After Mr. G refused to eat for six days, staff decided to track down Jellybean. On their reunion Mr. G immediately perked up and ate for the first time in almost a week! Friends come in all shapes in sizes! Although they’re an unlikely combination, when Sunday met her newest bestie Roger, they just clicked. Abandoned at two months old where she then ended up in the kennels, Atenea was lucky enough to find her way to Wings of Heart Sanctuary. Not long after arriving she befriended Camille who was also settling into her new life. Here they are spending a lazy afternoon in the field playing with leaves. Sharing such a beautiful bond, thanks to all the encouragement from his best pal Lief, Mookie continues to gain confidence and grow stronger every day he’s at the sanctuary. Visiting Claire continually throughout the day, Gus is very protective of his best friend and when she ventures out into the yard he stays right by her side, keeping an eye out for bigger animals and making sure she’s safe. As you can see from the photo, Gus loves to give Claire kisses on the head! Dogs are trained to not hurt farm animals but not good to push them to the point they react out of fear or anger towards other animals. Respect your dog’s boundaries when it comes to other animals or you may regret it and have a worthless dog. No dog is worthless, but some are not trainable. Deana Nw Same thing- if they are not trained they are a hazard to themselves, people and other animals.